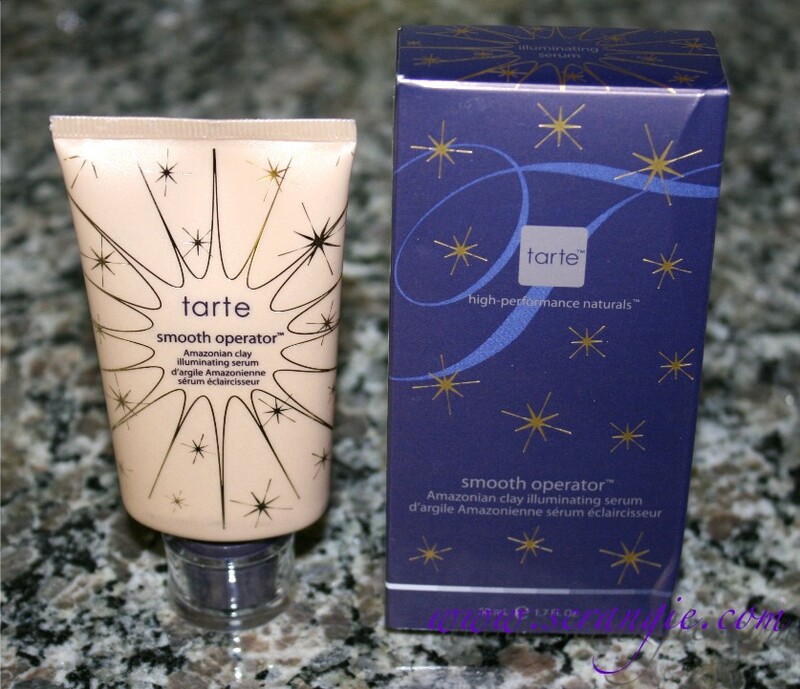 I first discovered the Tarte Smooth Operator Amazonian Clay Illuminating Serum through one of those deluxe sample kits that Sephora sometimes does. It came as a 0.3oz sample tube in the In The Glow kit (the same kit which also led me to discover my beloved Boscia Black Mask) and I don't know if I ever would have tried it otherwise. I'm glad I did, because it's become one of my most favorite everyday beauty items. I love the pretty purple box it comes in, but what's up with Sephora smashing everything to hell lately? Within the past year or so, every time I order something from them, at least one thing in the box comes looking smashed or mutilated and sometimes actually legitimately broken. Someone in their warehouse/shipping department must have anger management issues. The actual product tube isn't pretty and purple, but it is still visually appealing. It's a fleshy-looking slightly sparkly squeeze tube with a star design and a purple cap with a plastic outer layer. The squeeze tube is neither flimsy nor overly stiff and the opening of the tube is small enough to keep it from being messy and over-dispensing product, but not so small that it's hard to get enough product out. The texture of the Smooth Operator Amazonian Clay Illuminating Serum is like a light silicone primer. It feels more wet than the average silicone primer, and a little more loose and lotion-like. It's more like a smooth gel with a creamy but not oily texture. The color of it seems worryingly dark, foundation-like and opaque when it comes out of the tube, but it blends out to almost nothing. 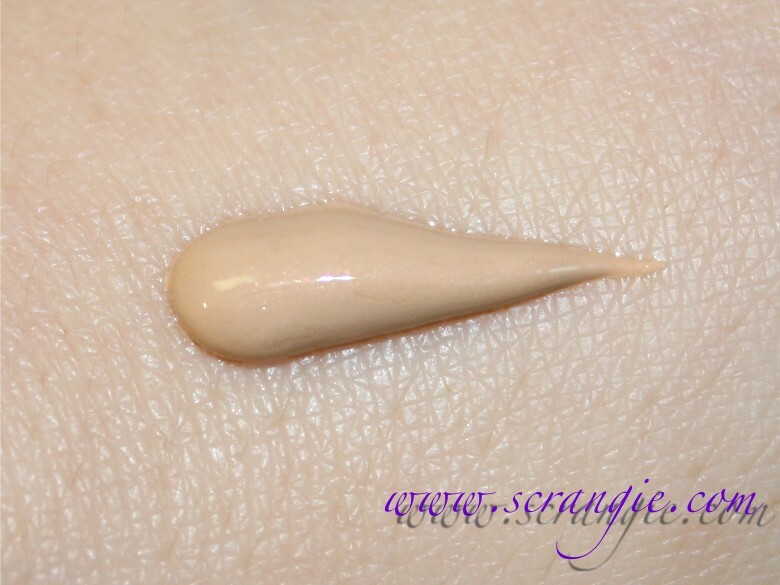 When it's blended onto the skin, it doesn't have much color but it does leave behind a slight golden shimmer and a soft-focus blurred effect. An illuminating serum fortified with Amazonian clay. Ideal for all skin types, this natural skin brightener is infused with Amazonian clay, vitamins, and tea extract to moisturize and replenish the skin. This healing clay completely neutralizes any negative skin condition so that you are left with a healthy, radiant complexion. Oily skin? Amazonian clay minimizes oil in and around pores to balance skin and keep product in place. Dry skin? This nourishing clay hydrates skin naturally to restore moisture so your makeup wears better, longer and truer. -Amazonian Clay: Reduces dryness and flakiness, improves skin clarity, elasticity, firmness, and texture while removing oil from the skin's surface for smooth makeup application and wear. -Chamomile Extract: Acts as a hypoallergenic and anti-inflammatory agent; treats and heals dry or damaged skin. -Vitamin C: Fights free radical damage and prevents oxidative stress and premature signs of aging, while brightening skin. -Sodium Hyaluronate: Retains moisture to plump fine lines and wrinkles. I actually don't wear this alone (like a primer) as recommended. I didn't really like it applied straight to my skin, but I adore it when mixed with my foundation. When I use this, I squeeze about half a dime's worth of product onto the back of my hand and then I pour out about a nickel-sized amount of my foundation on top and blend them together. I then use a damp Beauty Blender sponge to apply the mixture to my entire face and occasionally set it with powder. Adds a subtle glow and luminosity to my skin without looking sparkly or greasy. It has shimmer in it, but when mixed with foundation, you don't see sparkles, just an actual, visible brightening effect. I am really happy with how this makes my skin look when used together with my Colorstay foundation. Makes my foundation go on extra smooth, much nicer than how it goes on alone. It both controls shiny spots and evens out dry spots. This is one of the packaging claims and it really does live up to it. Doesn't make me break out. When I have dry, flaky areas on my face, it helps make them look smoother and doesn't draw attention to them. The tube lasts forever. It took me months to finish the sample tube, and I've been using the full size (1.7oz) for almost four months and haven't even put a dent in it. When I use it alone (which I've only done twice), it sits weird on my skin and feels strange. Wish the tube was purple. If I overdo it and use too much, it makes my foundation too slippery and it won't apply evenly. It controls oil for a good long while, but around the 6-8 hour mark, I do need to reapply powder or use blotting linens. I've been on this quest to start paying more attention to my skin/skincare routine and not just the fun things (why spend money on moisturizer when you can spend it on neon green eyeshadow, right?) and while this was an accidental discovery (would have never tried it if it wasn't included in that kit), it's turned out to be one of the best things I've ever used. I've been using it every single day since last September and I still love it. I love the glow it gives me, the brightening effect it has on my skin, the texture-smoothing aspect, the way it absorbs oil but also doesn't make my skin dry or cakey from the clay. Everything. It's not a miracle worker, it doesn't give me 100% perfect skin just from using it, but it does make an obvious, noticeable difference for me, and that's what's important. Also, after using this and being really impressed by it, I have a renewed interest in Tarte. I tried a sample of the Amazonian Clay finishing powder and loved it, so I ordered the Amazonian Clay 12 Hour Full Coverage Foundation (should be here any day now) and that Miracle of Maracuja kit that was the QVC Today's Special Value last week... Hopefully I like those as much as I love this stuff. I got my Tarte Smooth Operator Amazonian Clay Illuminating Serum from Sephora, $32 for 1.7 oz. Sephora shipping is just the worst. I ordered one of those deluxe makeup palettes as a christmas gift for my sister a couple years back. The palette arrived nearly broken in two. It looked like somebody had actually stomped on it. The apologetic customer service rep promised to send a free replacement. Imagine my surprise when, somehow, Sephora managed to keep the outside of the replacement palette intact, but everything inside was crushed and dislodged. I think I gave up and got my sister jewelry that year. I can't believe they let this happen. They have great customer service, but how on earth is everything showing up broken? The shipping box is always *pristine* but something inside is bound to be smashed, cracked, dented, or completely broken every single time lately... They must have hired The Incredible Hulk to pack their shipping boxes or something. I agree purple will be nice, but what about combination sensitive skin? I think this would be perfect for combination skin, and probably nice for sensitive skin. It is a gentle formula with soothing ingredients, my skin isn't very sensitive but it is close to being combination and it hasn't caused any bad reactions or irritation for me. Aw, I'm sorry! There has to be someone who imports Tarte for you guys... I'll have to do some Googling! Tarte does seem to be one of the better brands. I got the Sephora 500 point sampler recently and was really impressed, especially with the Amazonian Clay finishing powder. I would definitely be interested in trying other stuff. You know whose shipping/packing I hate? Bath and Body Works. They pack the boxes with like 846 feet of this crinkly brown paper, but it's all one piece so it's gigantic and everything's always tangled in it! But yeah, I loved that Tarte 500 point perk, it was the first one I felt was worth the points in a long time! Loved this review - I'm going to put this on my list of things for my parents to buy when they hit the states on holidays this year! Thank you! It's really nice, I hope you like it! I think my oily skin would like that product! 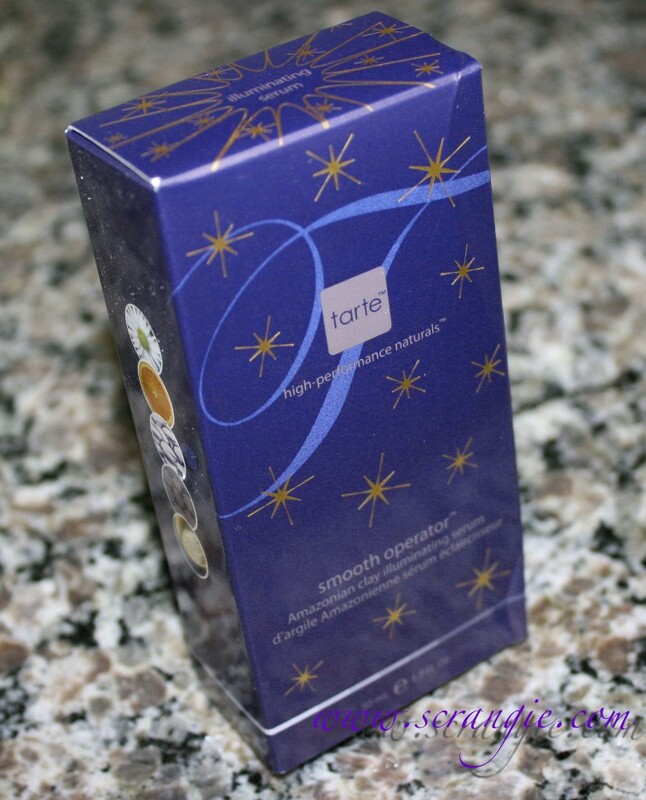 I'm a huge fan of Tarte but haven't tried that product yet. I was looking for a good review first, and here we go. Thanks so much for the detailed review, I'll probably will give it a try soon. Thank you, I'm glad my review was able to help! Definitely get a sample of this from Sephora if you can, you'll probably love it if you like Tarte products in general! But, but, if it were purple it would get mixed up with Urban Decay! True :) But I can never have too much purple! I have two sample tubes of this primer sitting in my stash. I should really put them to use! 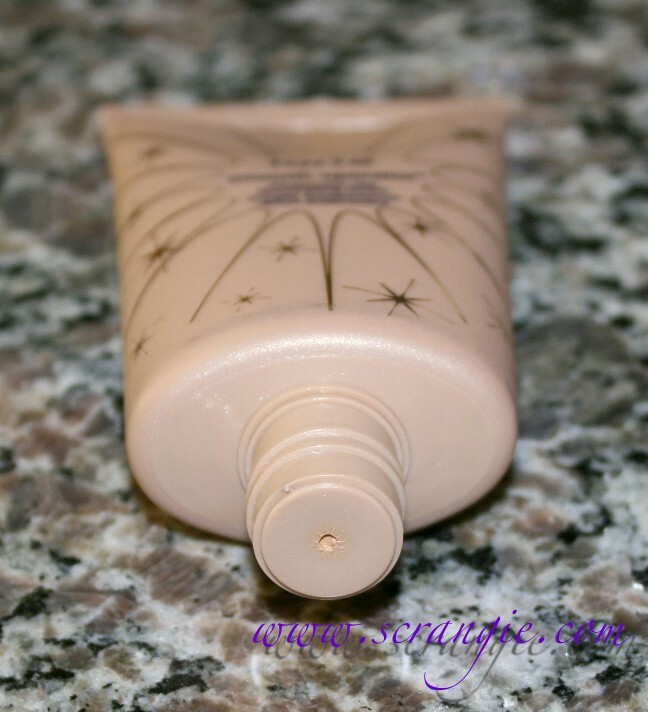 I used the tarte amazonian clay smooth operator tinted moisturizer last summer and loved it. Hiya! First time commenting here, ridiculously, since I've been lurking for a million years. 1. Do you think this would work well on people of various different skin tones? I'm super-pale and have sort of yellowish undertones, so I have trouble finding things that look good on my skin, especially since I hate really heavy foundations, tend to prefer matte to dewy-looking foundations, and tend to look really weird in bronzers. 2. How does the finish of this differ from dewy-looking foundations? It *looks* different in photographs, but sometimes it's hard to tell. Bonus question unrelated to the post: have you ever checked out Kiss My Sass cosmetics? I only ask because I remember you were kind of obsessed with blue lip glosses and, thanks to your post on the subject, I tried one from KMS that I'm kind of obsessed with myself now (Blue Velvet). 1. Possibly. I'm fairly pale (but not porcelain pale) and I don't notice this having any tint on my skin, but I always mix it in with my foundation, so hard to tell. This has enough color to it that if you're very light, you'd probably see some tint using it alone. Might be too dark, I'd recommend seeing if Sephora will make a sample of this for you. My weakness now too! :D And you are welcome. And, because I forgot to post this in my last comment: thank you for this blog. You're always sharing interesting things with us-- I've been turned onto at least 4 products since I started reading-- and I, like the rest of the world, love your swatches. I first got this in a super large sample tube. I do like a lot of the Tarte products. I currently use their Smooth Operator spf which is their light weight Amazonian Clay (LOVE) tinted moisturizer. When I want a bit more coverage, I use the Tarte AC full coverage foundation - but on both I blend them with this product. I really like it a ton. The Amazonian Clay keeps me from having break through shine yet it does not dry me out either...and this product gives me the glow that the other 2 products don't quite have in them. Just got the foundation in the mail yesterday- I think I bought the wrong color, but I like the finish so far! Thank you for the really detailed review! As always, you have answered any and every question I could have about this product. 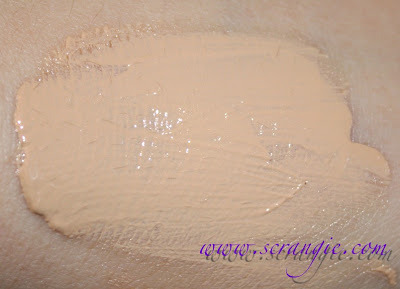 I also use Revlon Colorstay as my Holy Grail foundation, but it can look cakey and slightly dry if applied wrong. I feel like this product would give my foundation the kick it needs to make it perfect. Hi! Awesome review! Would you use this as a primer or primarily highlighting the high points of the face? Sephora MUA was raving about this as a primer, highlighter, and basically a good all over the face type of product. I'm in the market for a new primer and can't decide between this one or the Hourglass Veil Primer. Do you have any suggestions or advice between the two? Thank you! You can use it for all three purposes, but I didn't really like it as a primer. I also didn't find that it did much as a highlighter all but itself, but it's amazing when I mix it with my foundation. 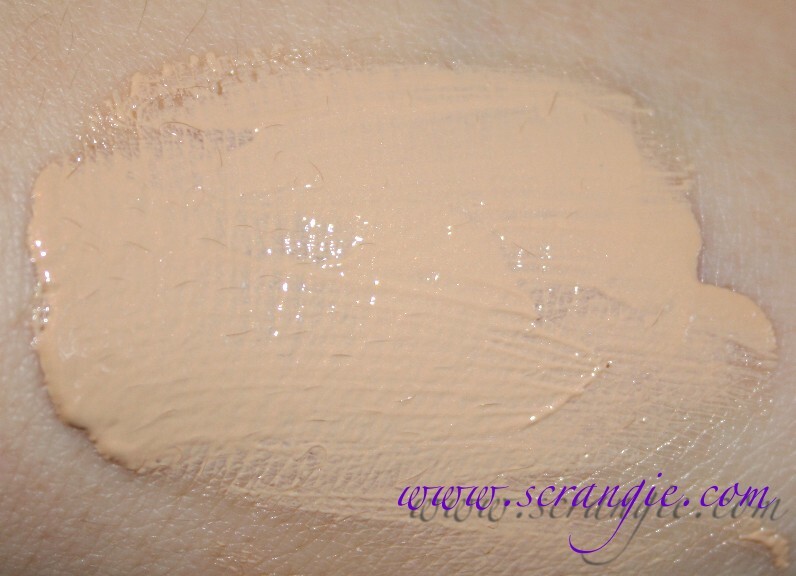 When I used it as a primer, it felt a little dry and there's so much tint and shimmer to it that it would probably be visible unless you used a full coverage foundation with it. I haven't used the Hourglass primer, but I'm really fond of the two Urban Decay primers, Benefit The Porefessional and the good old Smashbox green tinted one.